The British carried out numerous atrocities but Nota Bene, Lord William Bentick, the 1st Governor General of India was known as the “most Benevolent Governor General”. He was hailed as the “Father of Modern Western Education in India” and is saluted even today for abolishing the heinous practice of Sati. The word root Bene finds its origins in the Latin word bene meaning “well” and is used to convey goodness, wellness, reverence, and honor or blessings. Benevolence is the disposition to do good for others. Championing the cause of the underprivileged is archetypal of beneficent personalities. Father of the Nation, Mahatma Gandhi rightly said “The simplest acts of benevolence are by far more powerful than a thousand heads bowing in prayer.” A benign personality, Bapu, was the answer to the benediction of a million Indians. A quick fact: Do you know how many Popes were named Benedict? – A staggering 15 of them. 1. Benign: Kind or gentle disposition, neutral, harmless. 4. Benefice: Paid position of a member of clergy. 5. Beneficence: Act of goodness. 6. Beneficiary: Recipient of gifts. 7. Benefit: Event organised to raise money. 9. Benevolence: Disposition to do good for others. 11. Benedicite: Blessing, a grace said at a table. 12. Benefactor: A person who gives money or other help to a person or cause. 13. Ab officio et beneficio: Suspension from office and other benefits. 14. Beneficial: That which brings about a positive result. 15. Benedict: A bachelor who has recently married. 16. Benefactress: A woman who supports other individuals. 17. Benignity: Kindness of attitude. 18. Omni benevolence: Universal generosity. 19. Nota Bene: Take careful notice. Confucius said “The man of benevolence never worries, the man of courage is never afraid”. 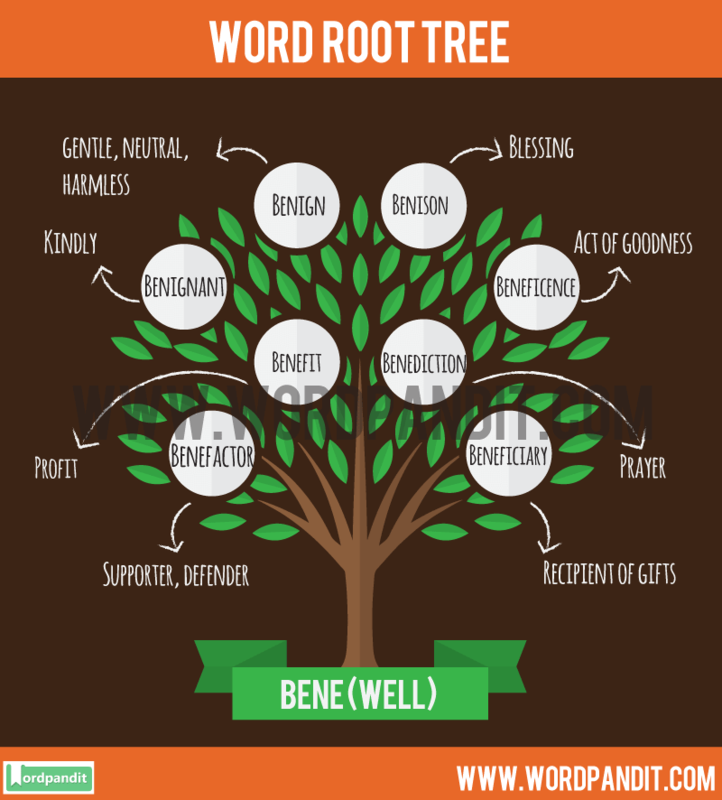 We hope this article on the commonly used Bene Root Word has been helpful to you in remembering the words based on the Root Word Bene and enhanced your vocabulary. Want to explore more Word Roots?